Why Use a Standing Desk at Work? Cast your minds back to early last week. 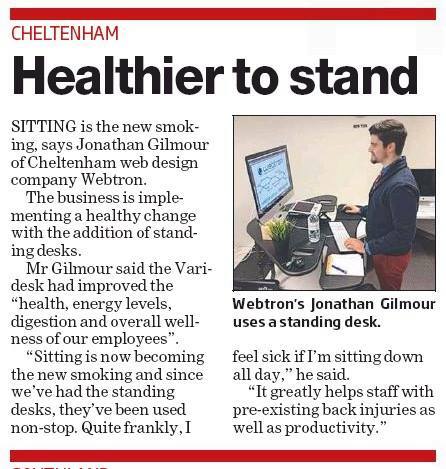 You may remember that Webtron was featured in our local newspaper, promoting the health benefits of standing desks. Not all of us at Webtron have graduated to standing desks, but it’s definitely a key trend that is taking over our workplace, one employee at a time. Webtron bought our third VARIdesk today. Why? Because after the numerous chiropractic appointments and the backaches from slumping in front of our computers all day, we eventually start to wonder why sitting is so embedded into our work culture – it’s plain obvious that our bodies weren’t made to withstand it. So unless you have an active job, as a retail assistant or a labourer, where you’re on your feet for most of your shift, chances are that you spend a lot of time sitting down. And it’s not doing you any good. And whilst those with the standing desks get to stand proud and tall, peering over our desks from day-to-day at the Webtron office, we can’t help but wonder why more people haven’t taken a stand yet (pun intended). We admire the fact that VARIDESK has taken something so simple, such as standing, and made an amazing innovation out of it. After all, we do spend most of our days working away at our desks, why shouldn’t we spend that time doing something that is good for us?